Twenty minutes. That’s how long Nho Trong Nguyen had to save his wife and son. The day was April 26, 1975 – four days before the fall of Saigon – and the South Vietnamese congressman had just hung up the phone. 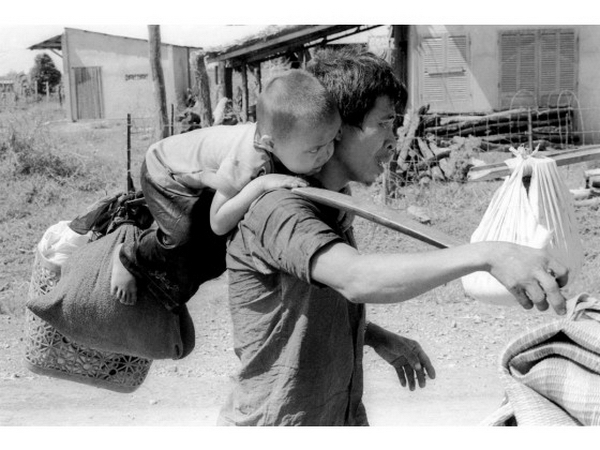 Nguyen raced through Saigon’s streets with his wife and month-old son. By the time they arrived, three seats remained on the bus. Nguyen helped his wife and child onto one as the doors closed. He kissed his wife goodbye, turned and left. One thing was clear as North Vietnamese troops marched into Saigon 40 years ago today. Some South Vietnamese would get out, but most would not. After 30 years’ involvement in Vietnam, the United States had promised to evacuate its 5,000 civilians and thousands more Vietnamese with U.S. ties should the north ever invade. By April 29, 1975, however, communist troops had circled the city, shelled its airport and blocked passage out. Among those who risked their lives to escape were a congressman, a doctor and a 5-year-old boy who all made it out and settled in Southern California. So at 7 a.m. on the day before Saigon fell, Dung Trinh, 5, collected his three younger siblings and followed his mother onto the sidewalk already brimming with people. Panic was in the air. 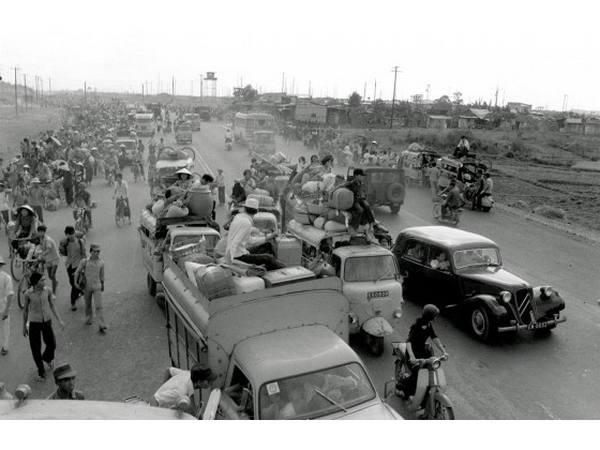 But that was nothing new for the Trinhs, already chased from Hue and Da Nang ahead of 150,000 North Vietnamese Army troops sweeping south and driving a half-million refugees toward Saigon. “I used to sleep under my bed rather than on it,” Trinh recalls. His father used U.S. connections to arrange for his family to fly out of Tan Son Nhut Airport on that morning. That’s where they now walked. “I heard shooting, so I could tell there was a battle going on,” Trinh says. The battle, it turns out, was for the airport. The night before, it had been shelled and rocketed. Since dawn, two planes had been shot down. No more planes would fly out of Tan Son Nhut. A most unusual song aired on radios across Saigon at 10 a.m.: “I’m Dreaming of a White Christmas” by Bing Crosby. It was code – a message to Americans and Vietnamese working with the U.S. government to report to designated pickup points where buses would take them to the airport. Nho Nguyen, the South Vietnamese congressman, sat in a safe house with hundreds of generals, ministers and VIPs. Two weeks earlier, Nguyen, an army veteran, had gone to the U.S. Embassy and asked to lead a guerrilla warfare unit. 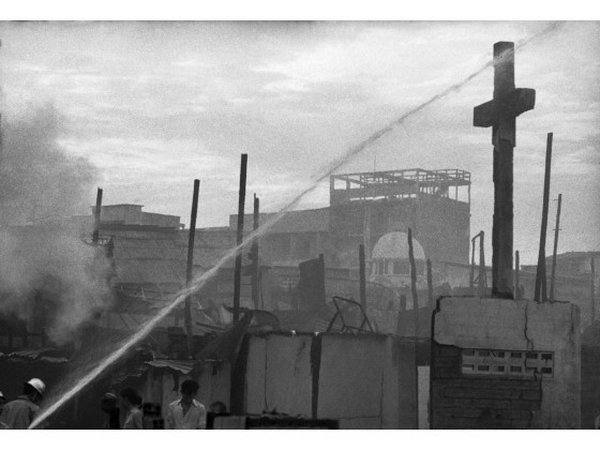 After that, Nguyen evacuated his family, staying behind to lead his people and his city. Finally it sunk in – within 24 hours, those people and this city would not be his to lead. Everyone was looking for a way out. Across town, 10,000 South Vietnamese ringed the U.S. Embassy. Crowds clamored to get inside Tan Son Nhut airport. More streamed toward the Saigon River looking to escape by sea. But still the buses did not come. Saigon was in free fall. Looting had begun. And the sidewalks were dotted with black boots and green fatigues of retreating South Vietnamese soldiers who had shed their uniforms before communist tanks rolled into town. Somehow, Dung Trinh and his family managed to get inside the airport. For two months and 400 miles, they had fled the oncoming North Vietnamese Army. But now it appeared they could go no further. U.S. Ambassador Graham Martin had just shut down the airport’s cratered runway and launched Operation Frequent Wind – his last hope to get anyone out alive. The plan: U.S. helicopters would ferry 50 people at a time to U.S. ships an hour off the coast. It would be slow. Dangerous. And inadequate. But it was the only option left. By mid-afternoon, helicopters began kicking up dirt at the airport as the Trinhs waited in line. “I could hear shooting and bombs going off,” Trinh recalls. Finally, the ramp of a helicopter dropped down and Trinh, his mom and three younger siblings climbed inside. As the city disappeared below him, he realized two things: He wasn’t going home again. And his dad was still down there, somewhere. College student Binh Pho reached the U.S. Embassy about 2 p.m.
He’d been lucky. He got in using a friend’s spare visa. By now, thousands crammed the embassy courtyard waiting for helicopters to lift them out. To Pho, it felt like he already was in America. “I felt so fortunate,” he says. But his good fortune would not last through the night. All day, Congressman Nguyen waited for a bus that never showed up. At 4 p.m., he and the minister of education took matters into their own hands. They got in a car and drove. First they drove to the minister of justice’s house and waited for a helicopter that never showed up. Then they drove to the U.S. Embassy where the crowd in places stood 300 feet deep. Marines in battle gear pushed gate-crashers off a 10-foot-tall wall and used rifle butts to keep others at bay. Those who scaled the wall bloodied themselves jumping into barbed wire, while others outside the gate held up their children, asking guards to take them. Nguyen and his friend worked their way up to a guard. But it was too late. The mob had grown too big. Too unruly. He was in a sea of people but had never felt more alone. For the first time in his life, he considered suicide. All day, rumors had been mounting of escape by sea. More than 30 South Vietnamese naval vessels choked the Saigon River. By nightfall, thousands of people lined the shores and docks, trying to climb aboard. Twelve-year-old Frances Nguyen, her mom and siblings jostled in the crowd. Her family had packed noodles, rice and peanuts, but in the crush to get aboard a ship, they dropped everything. “The only thing I carried was a handbag,” she says. 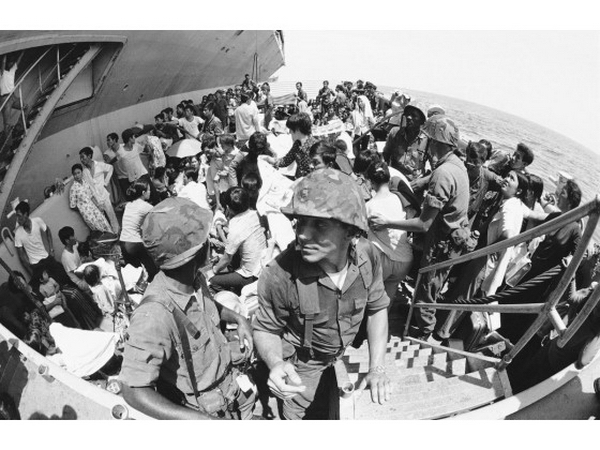 The crowd was orderly at Saigon’s Cuu Long Naval Base, where Huu Vo and five family members boarded a naval boat about 8 p.m.
Vo, a medical intern, had planned to stay in Vietnam, but it was his birthday, so he took the day off and drove his brother, Dac Vo, and Dac’s family to a small boat waiting on the river. On the spur of the moment, Huu Vo decided to jump on, too. He had told no one. He carried nothing but his black medical bag with a stethoscope and blood pressure cuff. About 9 p.m. the small boat drew alongside a large naval ship. Someone threw down a rope ladder. His niece and nephew were too small to climb, so they were hauled up in fishing nets. As they sailed to sea, Huu Vo watched night fall over Saigon. The city was about to fall. About the time Vo was jumping on a boat in the river, Congressman Nho Nguyen was jumping a wall. His friend, the minister of education, left for the French Embassy, and Nguyen felt desperate. That’s when he saw a young man climb onto a motorcycle along the embassy wall and pull himself up and over. Nguyen did the same and landed with a thud. Alive and unhurt. Immediately, a Marine fired a shot into the air, ran up and grabbed his collar. “Sir, I’m a congressman,” Nguyen said. 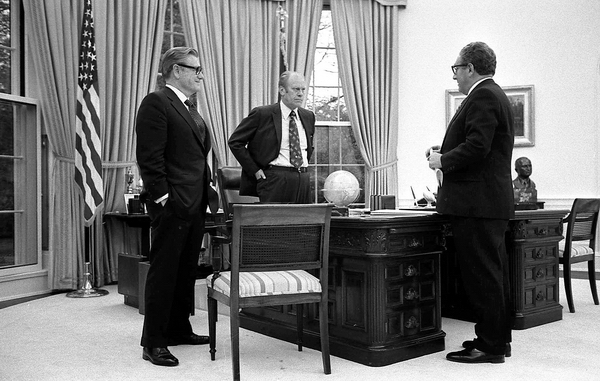 He named the diplomats he knew including First Secretary Richard Thompson. The guard called Thompson, who came down at once. As he and Thompson hugged, Nguyen was overcome with emotion. Nguyen says Thompson took him to his office and, while shredding documents, sat at his typewriter and typed: To all official personnel of U.S. government, this is a special guest of the USA. 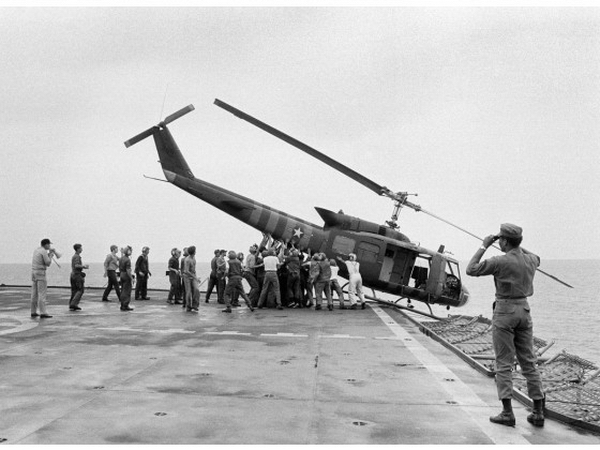 Moments later, Nho Nguyen climbed aboard one of the last helicopters to leave the roof of the U.S. Embassy. 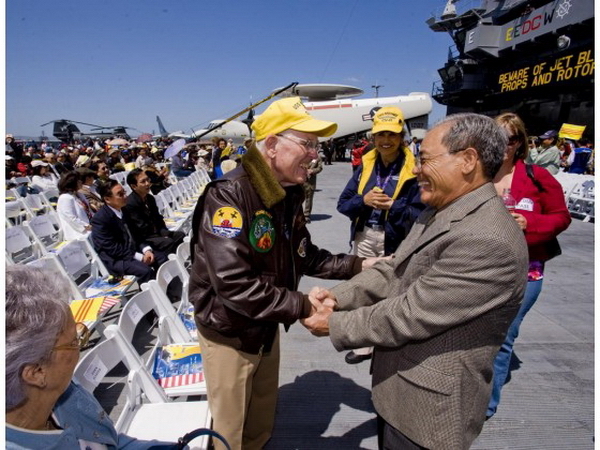 In the first moments of April 30, 1975, 5-year-old Dung Trinh slept aboard the USS Midway. Dr. Huu Vo stood on a naval ship sailing down the Saigon River. Congressman Nho Nguyen stared out the window of a helicopter as if watching a funeral. 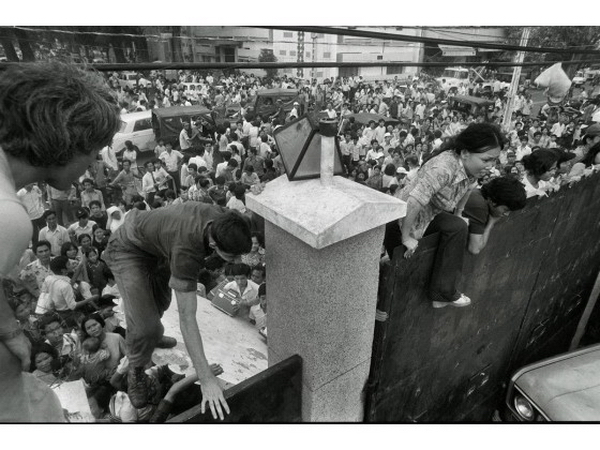 Back at the embassy, more than 1,000 Vietnamese still waited for helicopters. One more, and student Binh Pho would be on his way. That’s when he heard a commotion in the courtyard. Overnight, President Gerald Ford had halted operations to ensure enough time to evacuate Marines guarding the compound. He gathered what he could and ran out the gate. At 7:58 a.m. on April 30, 1975, choppers airlifted the last 11 Marines in Saigon from the embassy roof – even as North Vietnamese troops rolled through the streets. By 10:30 a.m., Saigon had fallen. 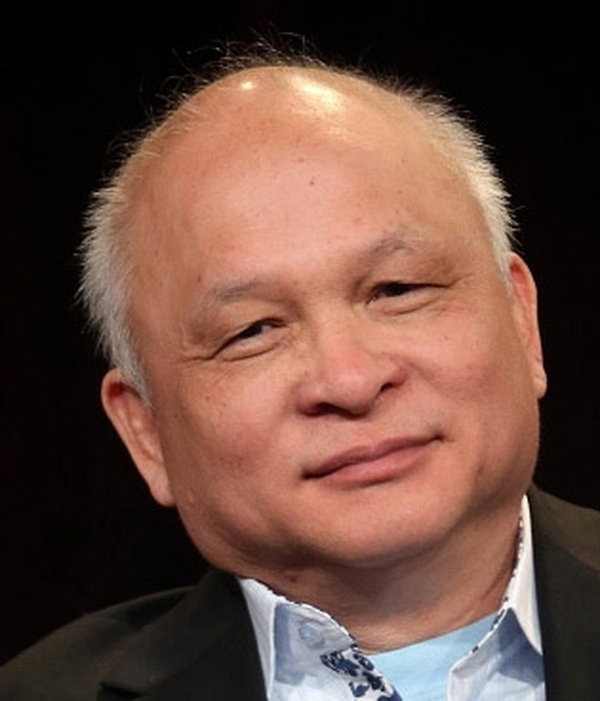 Dr. Huu Vo heard the announcement over his ship’s loudspeaker. For the U.S., it signified the end of a war. 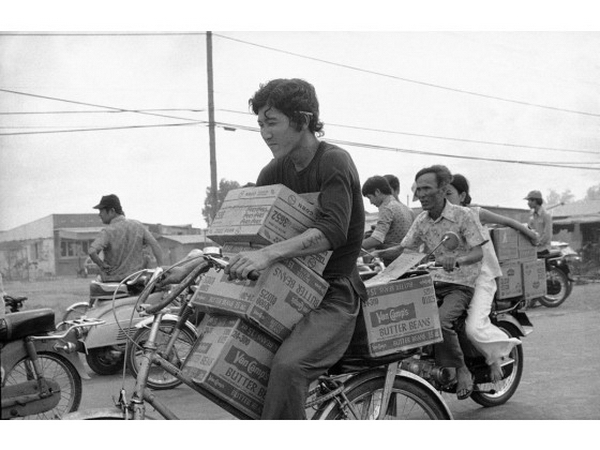 For the South Vietnamese, it signaled the end of a nation. Over on the USS Midway, however, one more miracle was about to unfold. The last to escape Saigon now appeared as radar blips on the USS Midway and other ships. “We looked up and counted 21 Huey helicopters circling our ship, waiting for a spot to land,” says Vern Jumper, air boss of the Midway’s flight deck at the time. All day long, his crew waved in South Vietnamese airmen who had escaped in helicopters hoping to find a place to land before running out of fuel. At one point, a small plane flew over the deck and dropped a note that fluttered into the ocean. It circled again and dropped another note. On its third pass, the pilot attached the note to a gun holster that landed on the deck. Can you move those helicopters to the other side? the note read. I can land on your runway. I can fly one more hour … Please rescue me. Major Bung, wife and 5 child. Capt. Larry Chambers gave the order to push helicopters off the deck to make room, and Jumper waved the pilot in. Everyone held their breath. It wasn’t till Bung Lee popped out of the 2-seat Cessna with his wife, 4 toddlers and a 20-month-old baby that 200 sailors let loose in cheers and applause. “He was one of the bravest men I ever met in my life,” Jumper says. And one of the last to escape the fall of Saigon. In 30 hours, the Midway had taken on 3,072 refugees from Marine aircraft and desperate Vietnamese helicopter pilots. 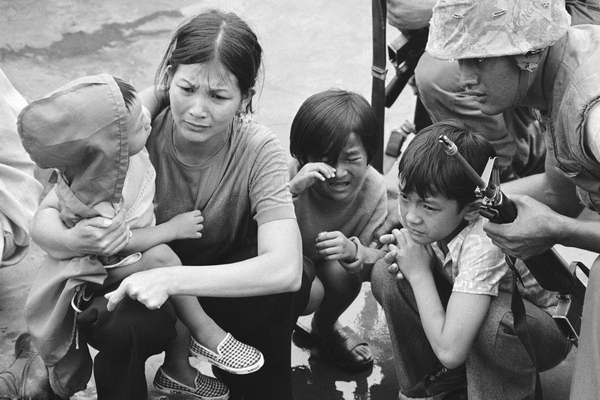 Those who helped with the evacuation of Saigon changed lives forever. Nho Nguyen, 76, is a retired Orange County Superior Court Judge. 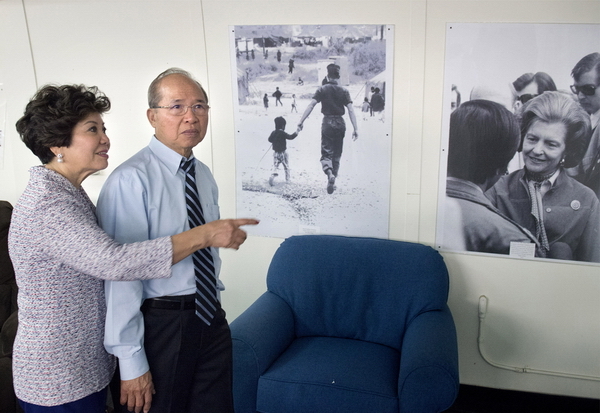 He and his wife, Bang Van Pham, a teacher and author, live in La Habra and have sponsored more than 1,000 Vietnamese refugees. 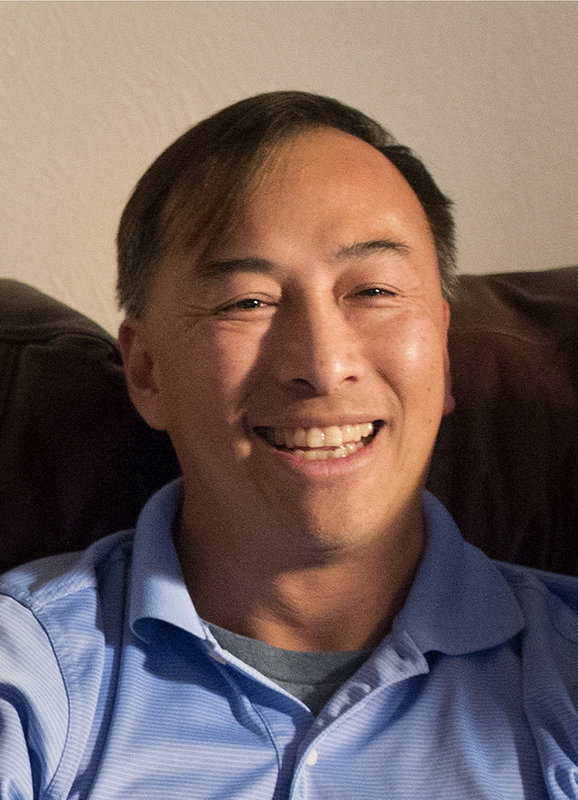 Dung Trinh, 46, is the medical director of the MemorialCare Medical Group in Mission Viejo. He lives in Westminster and is chairman of the board of the nonprofit 7 Day Hero, which supports the sick and orphaned in Vietnam. 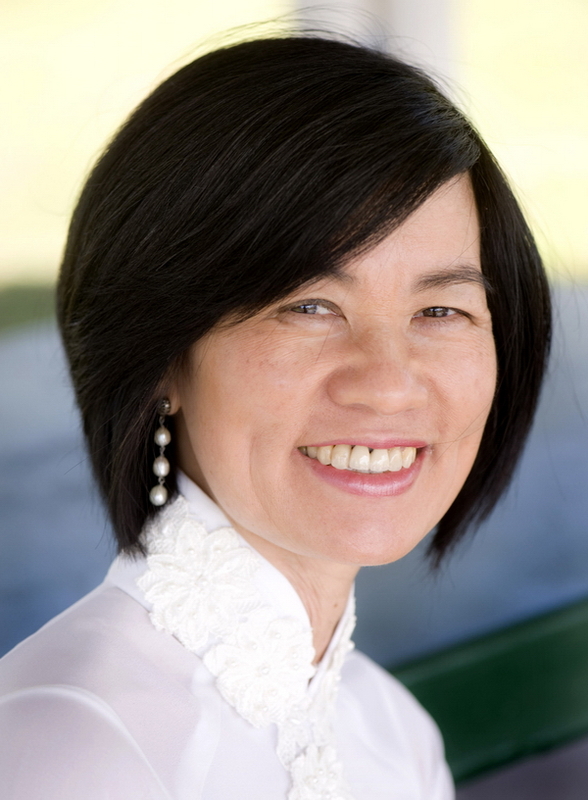 Huu Vo, 65, is a doctor with homes in Diamond Bar and Newport Beach. 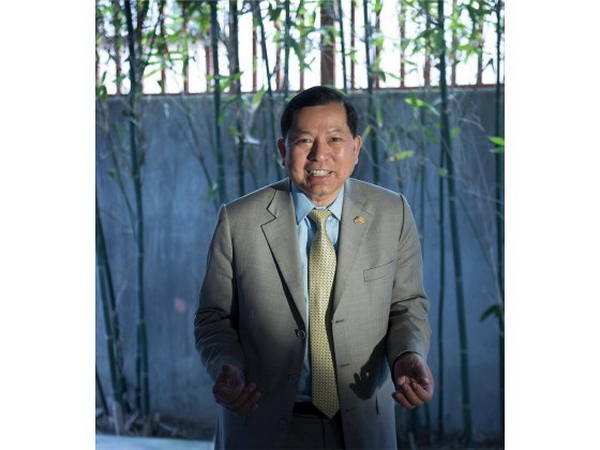 He’s president of the Federation of Vietnamese American Communities of USA, a national umbrella group for 46 Vietnamese groups across the country. Frances Nguyen, 52, owns Golden Trophy and Awards Co. She lives in Westminster, where she became the first female president of the local Chamber of Commerce. Vern Jumper, 83, retired from the U.S. Navy in 1982 after 31 years of service. He’s now a docent on the USS Midway Museum in San Diego. 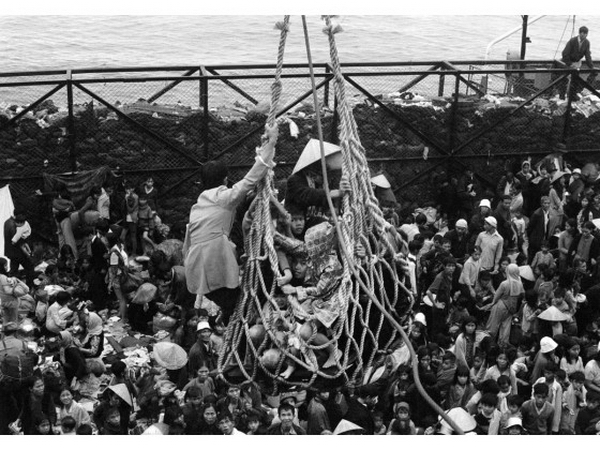 Last weekend, Jumper welcomed thousands of Vietnamese Americans back to the ship that rescued them 40 years ago today. Staff writers Roxana Kopetman, Chris Haire and Mark Eades contributed to this report.